Legendary Tales is a free fantasy game system. Far from being Lite, Peter has stitched together a horde of detail, ideas and information providing one of the most awe inspiring character creation mechanism I've seen. 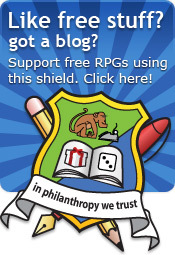 However, is it just another free fantasy RPG? Moulding your game world avatar is an awe inspiring process that cannot fail to produce a blooming, colourful character. Most of the character is randomly rolled or based on those rolls. This loss of control is not everyone's cup of brown but it does make the creation system slick, avoiding hours of pouring over point assignments. Random roll systems also lend themselves to batch creation of NPCs, which is a gift to the GM. On the whole, it is a majestic process I recommend you look at, as I will fail to do it justice in a simple blog post. You begin by selecting a race from the typically benchmark set of Human, Half-Elf, Elf, Dwarf (why are there no half-dwarfs? ), Halfling, Gnome, Half-Orc, Orc, Troll, Ogre, Goblin and Dark-Elf. Each are well described, including social and religious traits. Each race has its own abilities and drawbacks, too. A character has 10 attributes: strength, constitution, dexterity, quickness, intelligence, self-discipline, aura, perception, intuition and presence, each rolled on a number of D6 depending on race. Aura is magical ability, intuition is a sixth sense which suggests that the player can plunder the GM for information (a Spidey-sense). The descriptions are all well formed, pointing out which attribute to use in various conflicting scenarios. The attributes are then converted into a % rank. I am not sure why the attributes can't just be % in the first place. Secondary attributes are next and cover resistences, movement, etc and are based on the core attributes. Next up are core skills, such as Native Language and Region Lore. 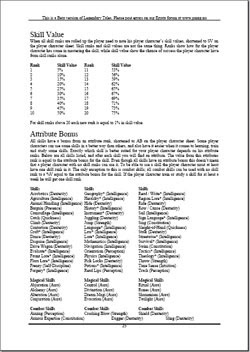 Background is rolled randomly on a race-specific tables and Magic traits indicate how much magical power you have to wield. The list of possible backgrounds for the different races is mind boggling. Virtues and Drawbacks are a balanced system that add special abilities to your character. They are rolled randomly, which means you might end up with a right dog of a character - or some kind of hero. I can see some combinations might cancel out but that is the purview of the GM to sort out. An occupation provides a ready-to-go pack of skills or you can create your own profession by picking from the copious (but not over-bearing) skill list. Each skill is based on an Attribute, which supplies a bonus. Morality defines an alignment for your character and you finish by furnishing your character with equipment, based on your race and background. This includes a preset list of items and a roll on a table for a bonus free bit of kit (occupation dependent too). I liked the idea of handing out shiny pieces of kit from the start. The mechanics are squirrelled away in amongst the description of Attributes. Each round, you act a number of times (depending on quickness) and then roll skills to hit and other dice do damage. Nowehere is this explicit. Although there is crunch in the form of exceptions and options, the act of resolving issues appears to be constant: d100 for checks and multiple d6s and modifiers for damage. Where Legendary Tales is very strong is in its detail. Although no setting is supplied, one is implied by strong, detailed descriptions of just about everything. A skim reader might consign Legendary Tales into the overflowing landfill marked 'Not Another Free Fantasy Game' but if you read a little deeper, you will find that an enormous amount of thought has gone into every race, profession and skill. The Bestiary, like character creation, is a good example of the towering wall of mountain there is to explore. Most free fantasy RPGs I skim read include the scantest amount of detail but Legendary Tales goes that much further, offering social and racial aspects. For babbling megalomaniacs, Peter recommends that all the rolls in the game are performed by the Gamesmaster in secret. To go further, he recommends that the level of wounds amongst the characters is not revealed. This replaces the cold statistics of most RPGs with more verbal descriptions of events. If I approached my player group with such antics, they would riot - clambering over furniture and jumping up and down on tabletops, whooping and banging bones together. Legendary Tales needs some streamlining and a brutal application of my guide to organising RPGs. It breaks pretty much all of the guidelines I recommend! Although not intentionally. I doubt anyone would write an RPG just to spite me. Legendary Tales requires a thorough proof read to correct places where English is not predictable (I imagine English is Peter's second language). I would also remove the 'Coming soon' element on the last page. The game is labelled Beta but I see that as a technicality. Finally, and most importantly, I would take great pains to indicate to the reader why Legendary Tales is different to all the other fantasy games out there. I would mention the detail, character creation system and the extra rule crunch. Hopefully, this review, your comments and a well placed email might coax Peter to create another revision! Legendary Tales is a cohesive, comprehensive and brimming with ideas in the form of detail. Random character generation mechanisms often suffer from limited choices but not so for Legendary Tales. 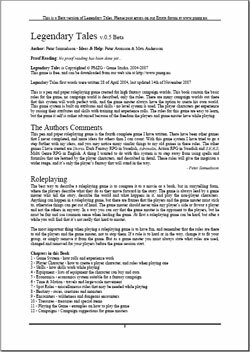 Mechanic crunch is layered upon a simple, solid mechanic and although it appears to be unfinished, there is plenty here for a GM who wants a little more from their free RPG. This is a very solid looking system. I would use this game. I would suggest this is a good first draft. I don't want to be judgmental on a labour of love. I look forward to the next draft! I've sent an email to Peter and hope that he might join us at 1KM1KT and give us another version. Anyhow, this is pretty cool. In an age of "lite" games and "quick start" systems, it's nice to see someone who's willing to get their hands dirty. My hat's off to 'em. @Badelaire - Given the large number of reviews on this blog sodden with gushing hyerbole, you wait until now to complain? ;-) Perhaps you would prefer it if I used less adjectives and said games were 'Nice'? *shudder* I like to think my exploration of the English language might spew forth the happy biproduct of expanding people's vocabulary. As for long games, I like long ones too. But they have to be succinct - no waffle. Legendary Tales is an excellent example of volumous content and no waffle. "As for long games, I like long ones too. But they have to be succinct - no waffle. Legendary Tales is an excellent example of volumous content and no waffle." I hope it at least has a flapjack or two. Maybe some French toast? A crepe? I like crepes. And waffles, for that matter. Why do waffles get all the hate around here? Why is it the midland Europeans have the best breakfast foods? Do the English even have a breakfast food that doesn't involve organ meats? Anyhow, still a good review. I'll have to pull this game down and give it a look-over sometime soon. Your recruitment methods remind me of a few CS Forrester Books i read as a kid. "welcome to the navy son"